The hottest trend for summer is in your own backyard! 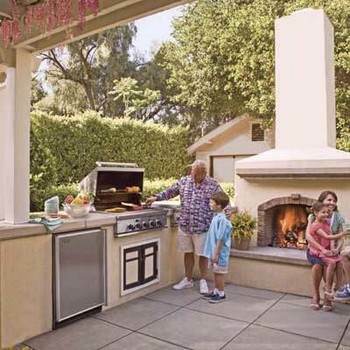 A well planned outdoor kitchen is great for entertaining friends and family. One of the best things about an outdoor kitchen is that it's outdoors and there are no worries with making messes or kids spilling. 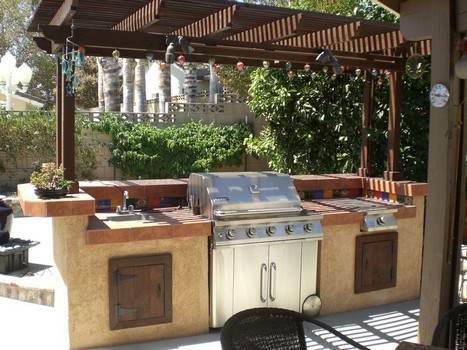 A good plan to follow when building an outdoor kitchen but yet trying to maintain a budget is to buy the grill first and then purchase other large ticket items. There are lots of inexpensive projects that can be added such as flowers, lighting, hanging plants, and comfortable outdoor furniture. 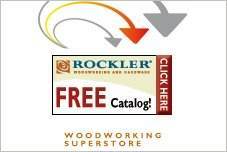 Choose from the free plans and designs below to build a great outdoor kitchen with a fully functional cooking area, grill, refrigerator and sink. 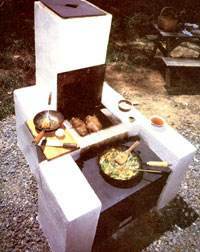 Build this beautiful outdoor kitchen using this plan with instructions, pictures and a list of required materials. 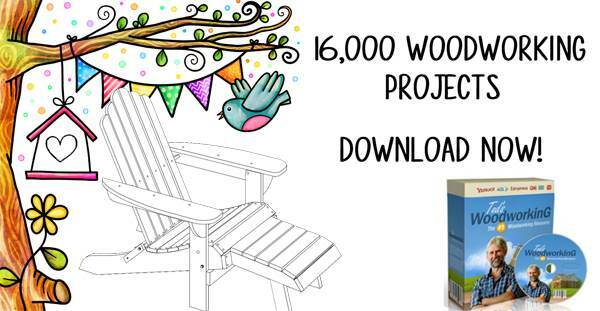 Complete instructions in step by step format to help you build an outdoor barbeque the whole family will enjoy. 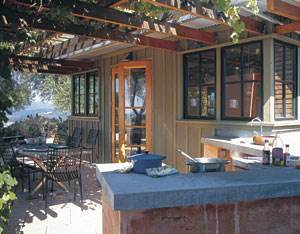 No plans but lots of good advice for planning your outdoor kitchen. 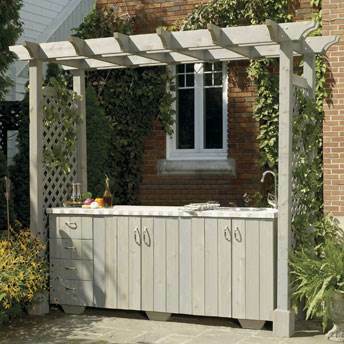 Build this attractive outdoor kitchen with pergola for added charm and shade; made from cedar wood this kitchen is weather resistant and will last for years to come. A gas grill is the center piece of this handsome and rugged outdoor kitchen with a spacious concrete counter area with ice sink plus two storage areas all wrapped in stone. 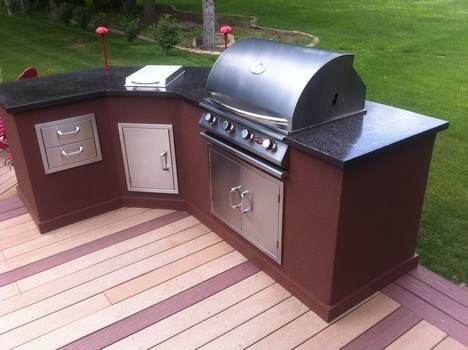 Steel studs are the back bone of this strong and sturdy outdoor kitchen, it has a concrete counter, natural-gas grill and plenty of storage for all your cooking items. 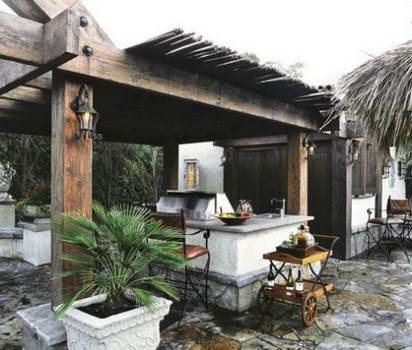 Learn how to save time and money by reading this detailed article that will help you build the best outdoor kitchen within your budget. 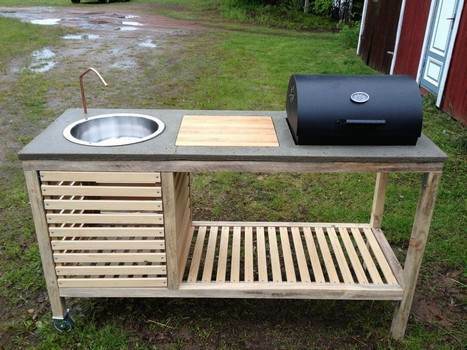 This simple kitchen is built on two wheels at one end to make it easy to move place to place, it comes with a sink, cutting board, storage area and barbeque grill. Here is a step by step plan with pictures to help you build this beautiful outdoor kitchen that has a pergola over head for shade.